Opening April 2018 in Crete, Abaton Island Resort & Spa provides a personal sanctuary for all its guests. 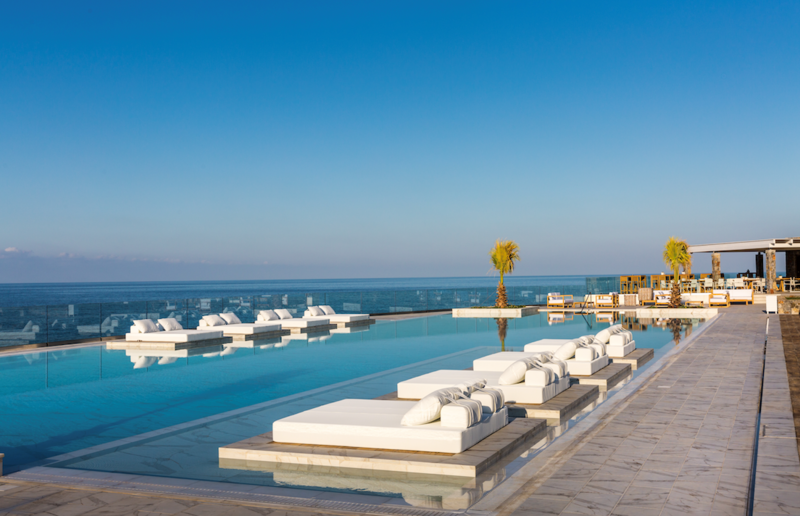 The brand new 5-star resort guarantees an amazing holiday with 152 uniquely designed rooms (71 with pools), ultra-luxurious interior design, fine dining on the water’s edge and exceptional guest service. The inspiring design, style and grandness of Abaton are apparent on arrival. Marble staircases, fountains of lights and historic architecture frame the entrance. The hotel is designed in such a way it reflects a beautiful maze, each room leads to another and never fails to impress. However, the feeling and emotion of arriving at Abaton cannot be described in text like its beauty, it has to be portrayed in reality, which is why the hotel decided to mark its opening with a storytelling video, to show guests the reality of how Abaton makes you feel. The concept was based on a modern take of the Legend of Ariadne’s Thread. “Guests often want to take a break from the stress of everyday life and Abaton provides a place to unwind, relax and enjoy. We want all our guests to feel their best with us, to explore Abaton and leave feeling refreshed”. Abaton is already making a name for itself due to its exceptional hospitality and attention to detail in guest relations. Kaloutsakis concludes “We are not a one size fits all approach hotel. Each guest is extremely important to us, we acknowledge their individual needs and go the extra mile so that each visitor can really find their personal sanctuary here at Abaton”. If you’re looking for a new hot-spot this summer, watch the brand new video from Abaton Island Resort & Spa, book a stay this year and find your personal sanctuary.